Students of the March for Our Lives: Boston on March 24th, 2018. Young people, parents and teachers have taken unprecedented action in Spring 2018 to fight for education justice. From the student-led March for Our Lives: Boston, supported by MEJA Director Charlotte Kelly and fiscally sponsored by MEJA coalition partner PHENOM, to college students demanding a #DebtFreeFuture at the State House, to DACA protection and our #FundOurSchools Week of Action, MEJA activists have been in the streets and making calls to fight for the schools that students and our communities deserve. 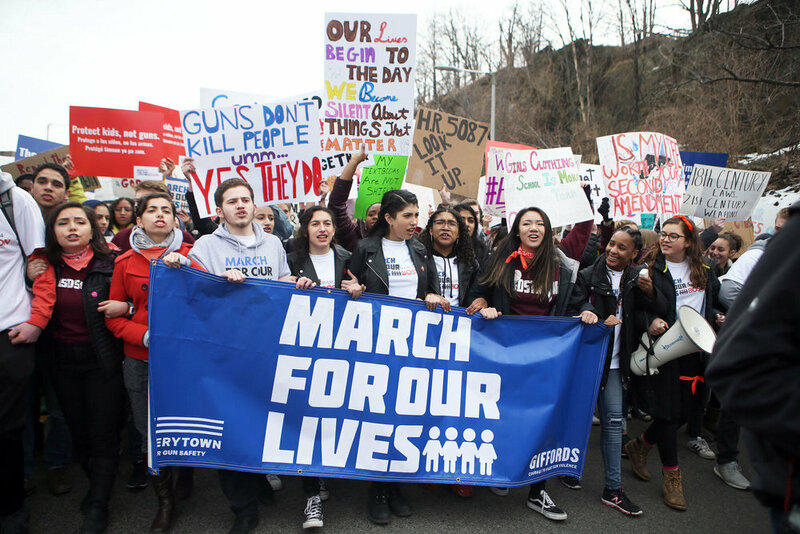 Over 100,000 people took over the streets of Boston on March 24th for the March for Our Lives: Boston demanding solutions to gun violence and school shootings. MEJA members helped to co-coordinate the event as adult supporters, including MEJA Director Charlotte Kelly, BEJA member and Boston parent Tonya Tedesco, and Rockland teacher and Brookline parent Graciela Mohamedi. In addition, PHENOM Director Zac Bears assisted with finances, communications and planning. The March for Our Lives student movement also included a walkout to the State House in mid-March (on a snow day!) where students advocated for a gun safety bill and linked that fight to school funding by advocating for a bill to fix the school funding formula and Foundation Budget for schools. MEJA and PHENOM are continuing to work with the youth leaders and will continue to build connections and lead the state in supporting youth-led, youth-centered organizing. “You have the power. You have the power. You have the power. You have the power. You have the power,” Amazan declared, pointing at different groups of students gathered across the room. Hundreds of students took that power right into the Beacon Hill offices of their state representatives and state senators laying out an ambitious and long-overdue agenda for a #DebtFreeFuture for public college students, alumni and their families. In April, hundreds of people across the Commonwealth called and emailed their lawmakers to demand they do more than just provide the bare minimum to our schools and colleges. MEJA also joined with the Chelsea Collaborative for a student-led #FundOurSchools lobby day. While we had broad support and gained almost 100 co-sponsors for our four budget amendments, the House refused to incorporate these amendments into the state budget for next year. As MEJA continues to grow our coalition, we will build up community support for our collective struggle to build a better world, starting with a good public school for every student in Massachusetts. Our campaigns to protect our public schools and fight for fully funded public education have several big battles coming up in the next few months and we will need your help. In that vein, MEJA will be gathering hundreds of parents, students, teachers and other education justice activists at our first statewide Education Justice Convening on June 23rd from 10AM to 2PM in Worcester. Please join us as we envision the public schools and colleges our communities deserve, solidify our demands from lawmakers, and gear up our campaigns for to #FundOurSchools and demand a #DebtFreeFuture through the Fair Share Amendment on the ballot in November.